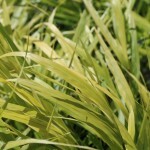 A perennial grass that slowly matures into a soft flowing mound. The thin, green blades develop red tones as the weather cools. In the fall, it is a bright blend of reds to deep golds. Beni-Kaze translates to "red wind". 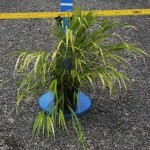 It will grow best in light to open shade, a well-drained soil, and regular watering. Cut the old stems to the ground in late winter to early spring.